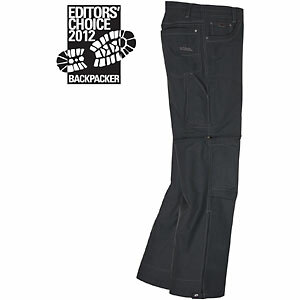 Extremely rugged trousers that are intended for military or paramilitary use, but are excellent for hiking, although a little on the heavy side. 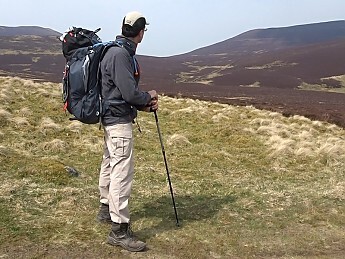 I recently hiked the Cumbria Way, a 73-mile trail in England's Lake District, wearing a pair of Stryke trousers by US brand 5.11 Tactical. 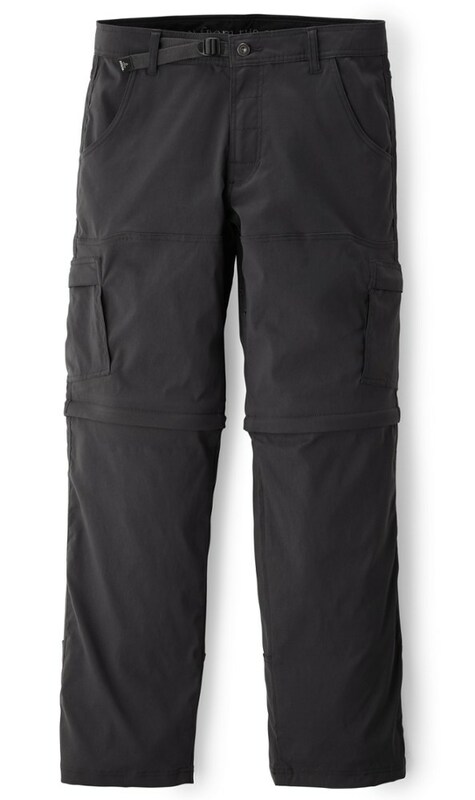 As its name indicates, 5.11 makes gear primarily for the military, but I thought that the Strykes would make good hiking trousers and I was not disappointed. I wore the Strykes throughout my journey, which lasted five days, and I even slept in them on the three nights that I camped. I found them comfortable, durable, and practical. Closeup of my thigh showing how water beads up due to the Teflon treatment. 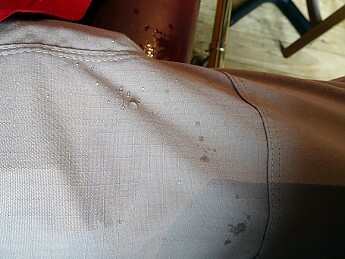 However, the trousers will soak through eventually in persistent rain. 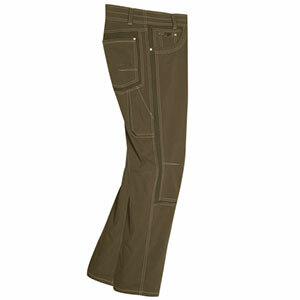 The trousers are very well made, with double stitching in many places. They are Teflon-treated, which makes them water-repellent and stain-resistant. On the first day of my walk I took a fall, as a result of which I ended up with mud all the way down the outside of my left trouser leg. I simply walked on and let the mud dry. At the end of the day's walk I brushed it off with my hand and only the faintest of dirt marks remained on the trousers. The trousers are true to size in that I normally wear size 34 long and I found them to be an excellent fit in this size. They are comfortable with an extending "tunnel" waistband, which I prefer to traditional elasticated waists; a crotch gusset; and a degree of stretch in the trouser legs. 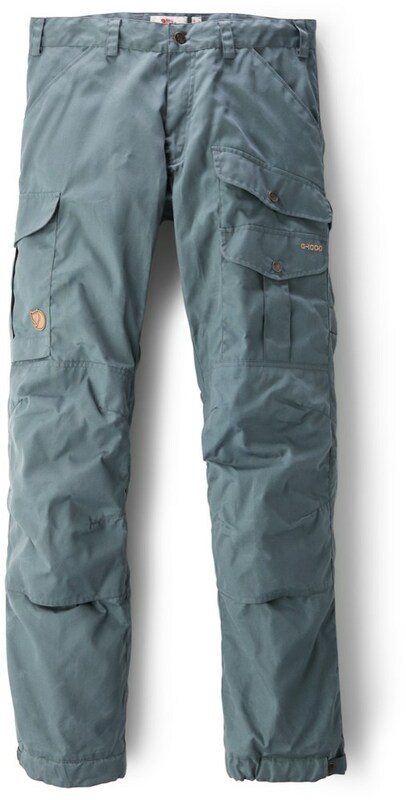 They are made of a special patented polyester/cotton ripstop material which 5.11 calls Flex-tac. It does not include any elastane. The trousers have twelve pockets in all. 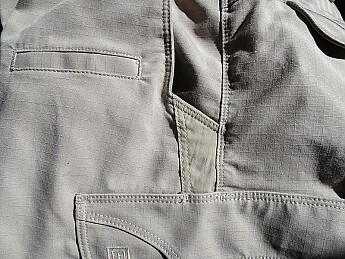 There are the usual hip and back pockets; slit pockets to the front of the hip pockets (visible in the photo above); and cargo pockets, each of which contains two inner compartments. The compartments are made for assault rifle magazines, but they are excellent for other items such as your mobile phone or (if you suffer from allergies like I do) packets of tissues. 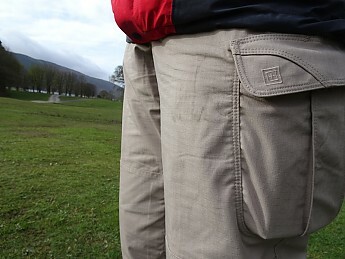 The cargo and back pockets have flaps which close using velcro strips. Velcro strips are often a point of weakness on trousers but these are sewn on well. 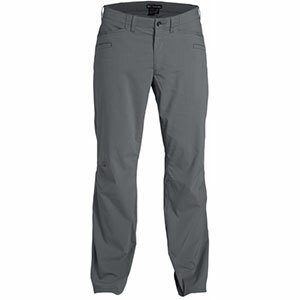 The trousers weigh 722 grams (25.5oz), which is on the heavy side even though the material does not feel heavy. They could be more breathable: at certain points on the walk when I was exerting myself more than usual, I felt my legs get clammy even though the weather was not warm. I do not recall experiencing this with other trousers. 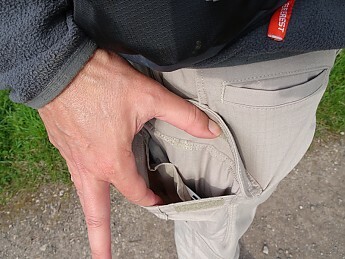 My only other complaint, if you can call it that, concerns the depth of the cargo pockets. They are capacious but I wish they were a little deeper. All in all, however, I'm impressed and very satisfied with these trousers. Thanks for bringing these to our attention, Charles. I hope the Cumbria Way trip went well. You're welcome Alicia. The trip was a great experience. 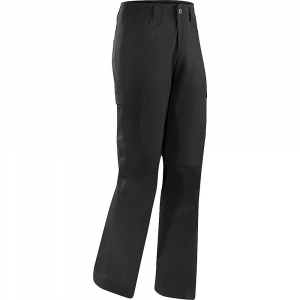 The 5.11 Tactical Stryke Pants is not available from the stores we monitor.